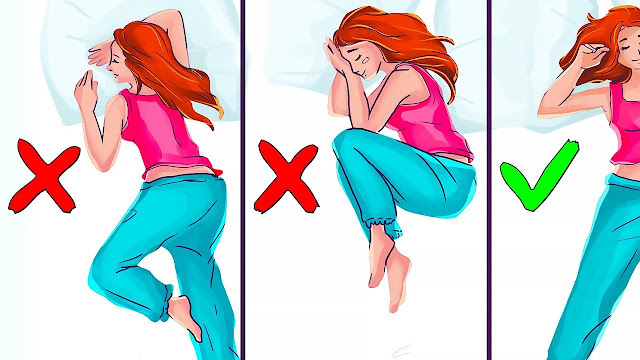 Home easy wake up experiment fall asleep faster fall asleep instantly good sleep insomnia help life hacks sleep experiment sleep position sleep schedule sleeping position waking up Never Sleep On Your Side Or Stomach: 5 Reasons! Why? Never Sleep On Your Side Or Stomach: 5 Reasons! Why? Never sleep on your side or stomach: Five reasons why? Sleep is probably up there on your list of favorite pastimes. Right? As soon as you get up in the morning, you're counting down the hours until you can crawl back into that oh so comfy bed. You don't really pay attention to your sleeping position. Just whatever is comfortable enough to get you into dreamland faster. Well, it turns out that you really should be paying attention. Before we get into the details as to why that is how about giving that subscribe to our blog. All right grab your jammies and let's get started. There's really not much variation to the positions you can sleep in. Unless you're clunking out sitting in a chair or leaning up against a wall. Some of us side sleepers others sprawl out on their bellies and still there are those who feel the most comfortable sleeping on their backs. Each of these positions can either help or hinder your quality of sleep. And they come with their own set of potential health risks as well. So, rejoice back sleepers because here are five reasons why you should never sleep on your stomach or side! #1 It strains your muscles and joints. These positions strain your muscles and joints and don't follow the natural curvature of your spine. Plus, it's pretty common to lean on one of your arms when you sleep on your side or tuck your shoulder under your ear when you're on your stomach. But doing this constricts the muscles of your shoulder and neck. Resulting in tightness upon waking that can take some time to stretch out. Rolling over on your back, however, can prevent this strain from happening in the first place. #2 It compresses your organs. Stomach and side sleepers are also compressing their organs which doesn't exactly do your system any good. Side sleeping is especially risky because it prevents your diaphragm from moving freely. Which can eventually cause lung problems! Trying to get a good night's sleep can be difficult when you're pregnant. So it's okay if side sleeping is more comfortable for you and this probably goes without saying. But pregnant women should avoid sleeping on their stomachs anyway. Just opt for your left side because it's much better for blood circulation which benefits all parties involved. #3 It can contribute to worsening heartburn. According to the Cleveland Clinic, sleeping on your stomach can exacerbate heartburn. So, if the pain of chronic heartburn and acid reflux keeps you up at night! You might want to try turning over to sleep on your back or on your left side. Sleeping on your left side, unlike the right, has been proven to help digestion and remove acid from your stomach and esophagus more quickly. Sleeping on your back with your torso slightly elevated is even better though. Since it helps gravity keep your stomach acid from trying to climb up your esophagus. Lying on your right side tends to aggravate heartburn. So try to avoid that when you're tossing and turning. Experts aren't exactly sure as to why this is? But most of them think it has to do with a lower esophageal sphincter being too relaxed to push stomach acid back down when you're in this position. #4 It can damage your nerves. When you rest your head on your shoulder or arm as you sleep on your side, you are also pressing on the nerves that run through the top of your shoulder and down your arm. This can result in finger numbness throughout the day, which is bad for whatever work you have to do that day with your hands. shoulder. Means you don't need to put your arm there for support. This will keep both sides of your neck the same length. Which means that one side won't be stretched too far. In the end, this will make breathing easier and prevent nerve and muscle damage. #5 You can get premature wrinkles. Smooshing half your face into a pillow can! According to dermatologist Dr. Jamie Davis, focus wrinkles on to whichever side of your face spends more time being smushed. Sleeping on your back not only prevents this from happening but also let your skin breathe throughout the night. Why sleeping on your back is better? Most chiropractors agree, that sleeping on your back is your best bet for good posture, reduced back pain, and proper spinal alignment. Keeping your back and neck straight also let your mattress do its job. You know that innovative lumbar support thing the salesperson kept going on and on about when you bought the thing. The ideal sleeping position is on your back without a pillow, which rests your spine on its natural curves, leaves your neck in a neutral position, and doesn't add any of the strain that would come from elevating it with a pillow. Of course, there are always going to be instances when this isn't the best option. If you have problems with snoring or sleep apnea, then most doctors recommend sleeping on your side to help with these issues. Some other good sleep habits to adopt. If you tend to fall asleep easily and stay asleep the whole night but still wake up feeling stiff, then try adding some 5 to 10 minutes stretching into your morning routine. Animals stretch as soon as they wake up and you don't see them rushing to the Kairo to get their backs realigned every week. If you have more of a problem falling asleep, then you should still benefit from a change in your morning routine. Adding some exercise to your stretches will make your body that much more ready to relax at the end of the day. Avoiding caffeine for several hours and your phone or computer for at least an hour before bed will also help your brain quiet down in time for dreamland. sure the muscle is in tight. You could also try massaging it or apply a heating pad. If you're still snoring even when you're turned on your side, then try clearing your sinuses out with saline before bed. Avoiding alcohol consumption close to bedtime also works wonders to reduce snoring. In fact, having alcohol in your system right before bed can decrease the amount of time you spend in REM sleep. So, an added bonus of avoiding it before bedtime is a longer more restful sleep. Making sure your room is comfortable also helps. So, if you can adjust your thermostat in between 68 and 71 degrees Fahrenheit. This is the recommended room temperature for the best quality sleep. Believe it or not, drinking too much water can also be detrimental to your sleep quality. The rule about getting eight glasses a day is. According to Glasgow based general practitioner Dr. Margaret McCarthy, utter nonsense that can actually cause kidney damage rather than preventing it. It's also not good for sleep since you'll be getting up periodically throughout the night to go to the bathroom. If you're still leading a mostly sedentary lifestyle, then it's better to stick to about five cups of water a day. If your problem is getting yourself out of sleep, then be sure to set your alarm clock for the same exact time every single day. Even on the weekends and stick to it. That way your body will settle into a rhythm and you'll eventually be able to wake up naturally without an alarm. So, what's your preferred sleeping position? Are you gonna try to become a back sleeper now? Let us know in the comments below.